Seventh graders at Matilijia Junior High School in Ojai, California, have been using the ACES curriculum to learn all aspects of science, from photosynthesis to seasons, ocean currents to pressure, bathymetry to food webs - you can even see some of their work on the right! Science teachers Carol Paquette and Nancy Wetter began their year with many of the ACES lessons and students created brochures to demonstrate what they learned. One lesson in particular that was eye-opening for students was The Ocean Through Time. Students were interested to learn how studying the ocean has changed over the years and how technology has advanced. They found it surprising that many of the protections for the ocean have been put in place recently, and now there are many agencies, particularly NOAA, who are charged with taking care of our planet's largest habitat. 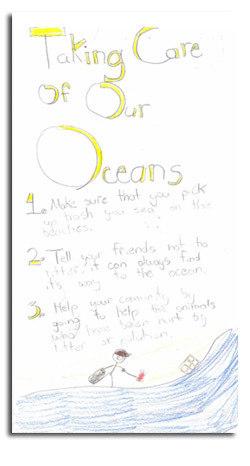 The teachers report that Matilijia students are most concerned about the issue of plastics in our ocean. About 30 students participated in a clean-up of a local creek, which is of course a part of the watershed that eventually leads to the ocean. Seeing first-hand how much garbage is carelessly tossed into water bodies was eye-opening for many students, who also began to understand how plastics and other marine debris can affect marine animals like sea turtles, seals and seabirds. Ms. Paquette explained, "The beach-clean up really helped to build [the students'] awareness, and to think about what they what they can do to alleviate the problem." In other words, Matilijia students are understanding how their lives on land impact marine animals such as studied by ACES students. Since October, GATE students have selected animals to track and have been studying their movements during their lunch periods. The students have become Species, Bathymetry, Sea Surface, and Phytoplankton Experts and are working with other Experts to consider all of the factors that affect their animals as they move. Ms. Wetter explains that this has been a really important part of the investigation: "I think this has opened them up to more creative thinking about animal," she said, "knowing that they can get help from other Experts allows for a broader discussion about the animals and their behavior." Some of these students are even involving their families in their investigations of sea lions, polar bears, and sea turtles; sharing what they have learned with adults and kids alike.